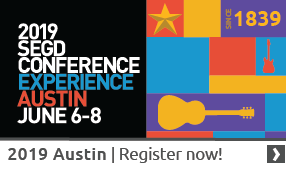 SEGD Design+Connections is a fast-paced, one-day workshop that will give you fresh insights on the most talked-about areas of EGD practice today. But it doesn’t stop there. 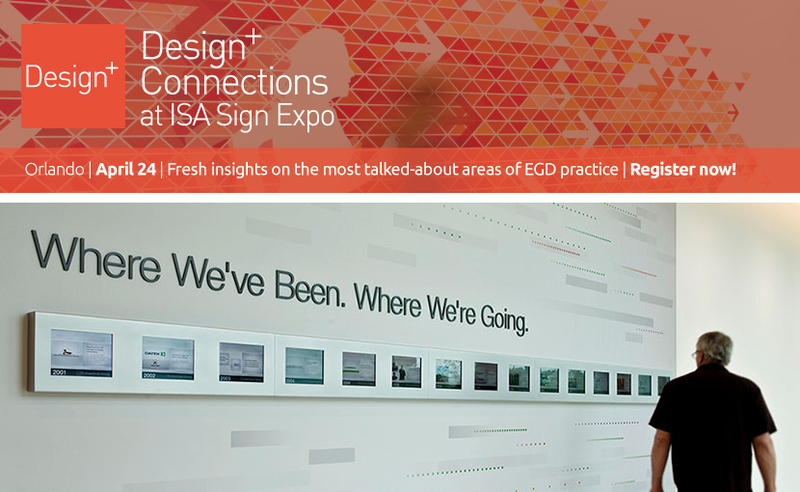 Your registration to SEGD Design+Connections gives you full access to the ISA Sign Expo that showcases the latest in printing technology, material innovations, and technology applications for your projects. This year’s ISA International Sign Expo is taking place in the South Building of the Orange County Convention Center in Orlando Florida. 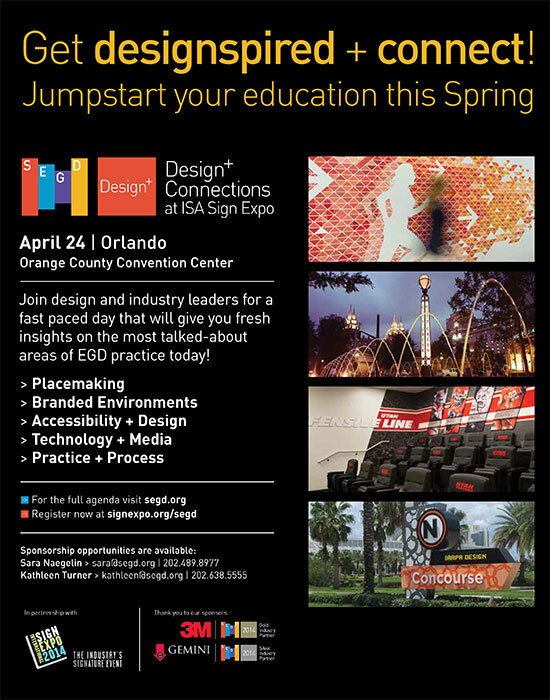 The SEGD Design+Connections Workshop will take place in room S320-H on Thursday, April 24, 2014 at 9:00 am – 5:00 pm. This event is registered with AIA CES for continuing professional education. AIA Members attending the entire workshop (full day) earn 7 Continuing Education Unit (CEU) in Health & Life Safety (3 CEU for the morning sessions and 4 CEU for the afternoon sessions). Credits earned on completion of this course will be reported to AIA CES for AIA members. Certificates of Completion for both AIA members and non-AIA members are available upon request. Join design and industry leaders for sessions on Placemaking, Branded Environments, Accessibility + Design, Technology + Media, and Practice + Process. Featuring professionals from some of the top design and industry firms working in EGD, including Selbert Perkins Design, Mayer/Reed, HOK, Infinite Scale, OpenEye, UEBERSEE, AECOM, APCO, iZone Imaging, and Century Sign Builders. Connect and learn about the latest at the ISA Sign Expo show floor from the leading companies you trust for materials, products, and digital printing! Sessions will encompass a dialogue that goes beyond the “how” and explores the “why” these projects have brought success to their clients, and where these designers find inspiration to craft truly engaging and memorable experiences. Each session will run one hour with ample opportunity for you to engage the panelists with your questions and further insights. Contact Kristin Bennani, Director of Sponsorship, or Kathleen TurnerDirector of New Business, at 202-638-5555. SEGD thanks our sponsors for their support! Congratulations to our weekly draw winner, Marissa Dessanti! View the Agenda with talk titles, speakers, and firms.